Like a beach ball at a baseball game or a graduation ceremony, New Jersey native, Dawn Mitschele (pronounced MITCH-eh-LEE), bounced around post high school from here to there with her guitar securely strapped on her back, picking up influences and experiences all along the way. The warm and sunny hands of San Diego seemed to be a suitable resting spot for Mitschele and she quickly became part of the burgeoning scene, which has produced high caliber stars Jewel and Jason Mraz (the latter becoming a good friend who encouraged her to keep writing and performing). 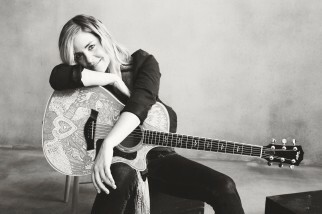 This self-taught singer/songwriter released her first album, In the Moonlight, has garnered her music acclaim in the 3 years its been available, appearing on shows, Love Bites, “Justified”, and has helped land her opening gigs with Donavan Frankenreiter, Meiko, and Edwin McCain. Her new five-song Love Remains EP (April 2012 release) continues to receive airplay on Santa Monica’s KCRW as well as hometown stations KPRI and 91X. She followed up her most recent tour of the East Coast this past spring with a repeat of last summer’s European tour, a mix of festivals, clubs and house shows. This fall finds her back touring the West Coast.